Password Manager Pro allows you to use MS SQL cluster as backend database. The steps to configure PMP to use MS SQL cluster as backend are significantly different from using a standalone SQL server as the backend database because PMP has been configured to connect to SQL server cluster only through SSL to ensure high level of security. To use a standalone SQL server as the backend database, the SSL certificate is created with the fully qualified DNS name of the SQL server and it imported in the LOCAL COMPUTER PERSONAL certificate store. In the SQL server configuration manager, the certificates matching the DNS name of the SQL server get listed in the certificate configuration screen. But, this procedure will not work in the case of SQL server cluster setup. In the case of SQL server cluster, you need to obtain the server certificate with the fully qualified DNS name of the failover clustered instance and install it on all the nodes in the failover cluster. For example, assume that you have a two-node cluster with nodes named test1.yourcompany.com and test2.yourcompany.com and a failover clustered instance of SQL Server named pmpcluster. To use the cluster with PMP, you need to obtain a certificate for pmpcluster.yourcompany.com and install the certificate on both nodes. Important Note : It is recommended to try these steps in a test setup first and verify if everything is working fine. You may download PMP and try using MS SQL cluster as backend. You can find the master encryption key in masterkey.key file which is placed under <PMP-Home>\conf directory. Prior to trying to connect PMP with SQL server, you need to enable SSL encryption in SQL Server. You may create an SSL Certificate and get it signed by a Certificate Authority (CA) OR it could be self-signed. 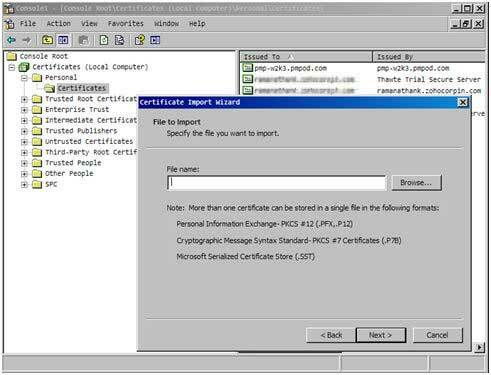 Use the following commands to create the certificate. Here, in the place of Common Name, specify the FQDN of the SQL Server cluster instance. The server certificate has to be installed in all the nodes where SQL server is running. The CA root certificate has to be installed in PMP server. On the Console menu, click Add/Remove Snap-in. Click Add and then click Certificates. Click Add again.You will be prompted to open the snap-in for the current user account, the service account, or for the computer account. Select the Computer Account. This adds the certificate to the PMP certificate store. Locate the self signed certificate just created, right click and export .pfx file. 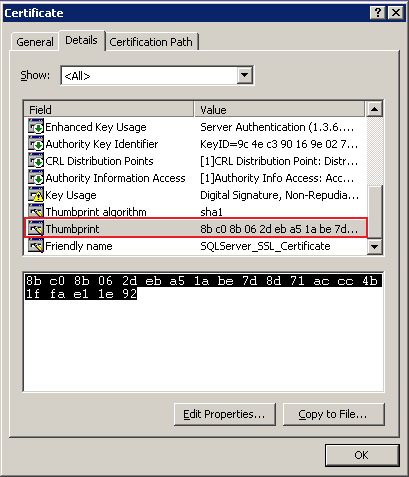 This key contains a property of the certificate known as thumbprint that uniquely identifies each certificate in the server. The Thumbprint value from the certificate which is created using the above steps, should be copied and updated in the registry's certificate property. Eliminate the Unicode character from the thumbprint. You can do this by pasting the thumbprint in a notepad. Save this thumbprint to the HKEY_LOCAL_MACHINE\SOFTWARE\Microsoft\Microsoft SQL Server\MSSQL.x\MSSQLServer\Certificate property. After completing the above steps, you need to execute ChangeDB.bat in PMP. Refer to Step 4 in the section "Using MS SQL Server as Backend" of Installation & Getting Started chapter of the help documentation for details.